In this second part on building an SAP Solution Manager roadmap, expert Tony de Thomasis looks at creating a Business Blueprint. Editor's note: The following article is the second in a three-part series on building a roadmap for deploying SAP Solution Manager. Part one lays out a common adoption sequence for companies to follow. Part two, below, lays out creating a Business Blueprint structure and taking advantage of the Business Process Repository. Part three will examine the use of accelerators to speed deployment. Solution Documentation is the most cost-effective application lifecycle management-based SAP Solution Manager module. This easy-to-deploy module helps companies determine all the business processes that are used in the production ERP system, in preparation for implementing the Business Process Change Analyzer (BPCA) application. Once it's configured, the ERP upgrade project group can use this tool to deploy Business Process Monitoring. As your processes mature and you gain more confidence using SAP Solution Manager, you can then build upon this first module with more challenging modules, such as Change Management. 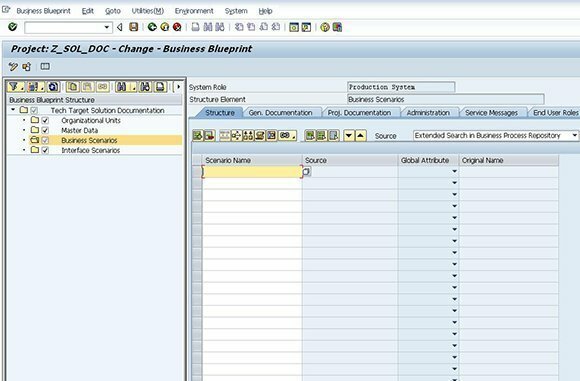 I explain how to build an SAP Business Blueprint using the Solution Documentation module as an example, but you can use this process for any SAP Solution Manager module you choose. As I go through each step, I supplement the Business Blueprint with an SAP Solution Manager roadmap to outline a proven implementation methodology. 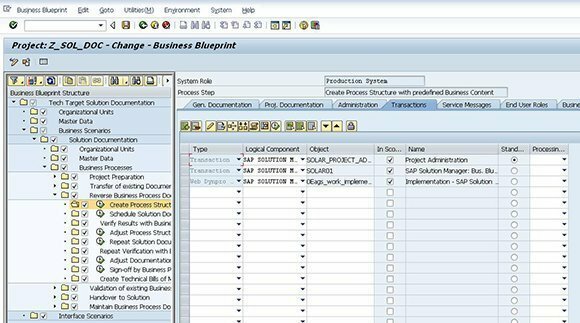 To build the Business Blueprint structure, start with the Project Administration drop-down menu in the SAP Solution Manager Implementation/Upgrade work center or use transaction SOLAR_PROJECT_ADMIN. In the fields provided, enter an appropriate Title and Project Name to create the optimization project. Don't be too worried about the solution at this stage, as you can assign it later in the process by following menu path System Landscape > Systems. The following screen prompts you for a few mandatory entries such as the Person Responsible and the Project Language. You may also want to select a start date ("Start Time"), along with the number of person days (PD)allocated to this project, in the Plan Data section of the screen (Figure 1). 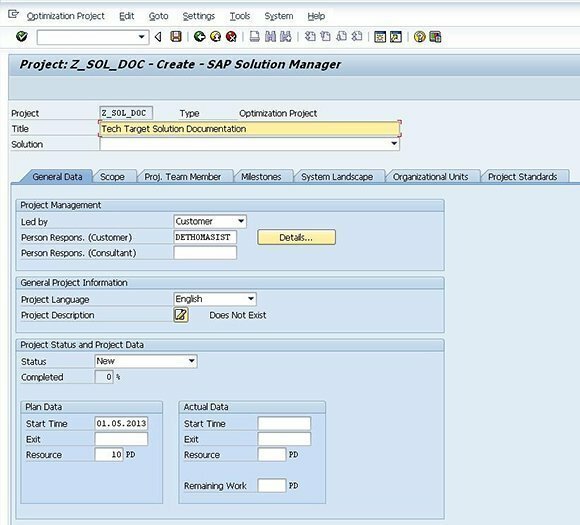 After you save the project, you can attach an SAP Solution Manager Roadmap to help guide you through best practices, including the use of content accelerators, to deploy your selected SAP Solution Manager module successfully. Engineering Services (ESRV) Roadmaps, which include the latest accelerators to help quickly deploy Solution Manager modules, are little known and completely underused. ESRV Roadmaps are based on best practices from numerous global Solution Manager deployments, and can help with speeding installation. To use ESRV Roadmaps, select the Scope tab and the Roadmap Select sub tab, or select the Business Blueprint option from the Go-To drop-down menu in the Implementation/Upgrade work center. Now navigate to the latest ESRV ALM Roadmap and select ESRV_ALM_01_CORE and ESRV_ALM_02_SOLUTION_DOCUMENTATION (Figure 2). Remember to save your project. The next step is to include all the process steps required to deploy your selected SAP Solution Manager module. SAP Solution Manager provides content for all SAP applications in the form of business scenarios, business processes and process steps. 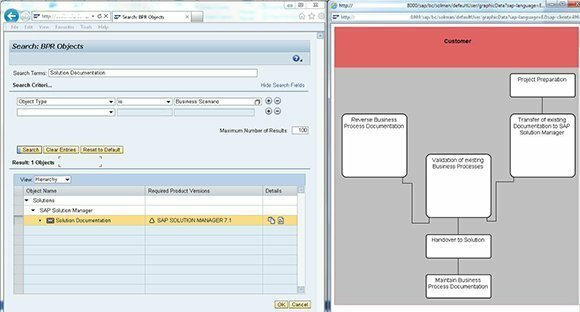 Instead of building up the Business Blueprint from scratch, the Business Process Repository (BPR) in SAP Solution Manager provides up-to-date reference content that you can use to produce a Business Blueprint that matches the module you want to deploy. To draw reference content from the BPR, follow menu path Go To > Project > Business Blueprint or use transaction SOLAR01. Make sure you are in change mode and select the Structure tab. Then select the Extended Search In Business Process Repository option from the Source drop-down menu. Click the Scenario Name column header to access the search screen (Figure 3). Enter the function you want to deploy (e.g., "Solution Documentation") into the Search Terms field and click the Search button. Change the view from List to Hierarchy. Click the show graphic icon in the Details column to display a swimlane diagram of the blueprint you want to create. Highlight the Solution Documentation line in the View box, and then click the OK button to drag the BPR reference content back to the Business Blueprint (Figure 4). After you save the project and refresh the screen, the system displays documentation, methodology, transaction codes and accelerators to support you during each step of the Solution Documentation module deployment (Figure 5). 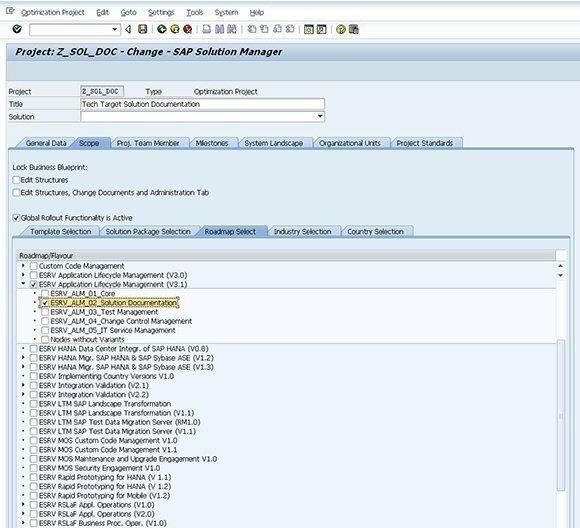 It's important to note that the SAP Solution Manager BPR content is continuously updatedvia support packages. When building any Business Blueprint global template, try to use the latest SAP Solution Manager release and service pack to ensure that you're using the most up-to-date SAP BPR version. Tony de Thomasis has been working with SAP software since 1986. He installed the first SAP R/2 system in Australia for Mobil Oil in 1989. De Thomasis has presented at events such as SAP TechEd, Mastering SAP Technologies and SAUG, authored more than 30 SAP Community Network blogs, written articles for SAP Professional Journal and recently co-wrote an SAP Press publication. As a certified SAP Technical Quality Manager at SAPWORKS, de Thomasis has developed SAP Solution Manager roadmaps for several SAP clients around the world using the techniques described in his articles.